Video security has witnessed a massive change over the last decade or-so thanks to the advancements in technology. The presence of leading brands in India has now made it possible to have access to the very latest CCTV cameras devices in Goa. Due to the ready availability of hardware and technical support, home and business owners are making a worthwhile investments to secure their properties and valuables. At the outset making a buying decision can get a bit daunting mainly to the variety of brands, configurations and features available on the market. Being dealers for a variety of CCTV cameras and home security systems we ensure that we make the buying decision process a knowledgeable one for our customers as we understand your security or surveillance goals and accordingly suggest appropriate hardware and support for your installation. For small to medium sized security needs there are 5 security system features that are suitable for almost every location. A crucial component of any security system is the ability to capture video at a resolution that is clearly visible at night. The footage that is being captured should be able to easily identify faces and movements in zero lighting conditions as majority of break-ins and thefts occur in darkness and thus having footage that is captures details will be key in any investigation. With components such as infrared LED’s, IR cut filters, software for true day/night recognition a security system can be equipped with nigh vision monitoring. Security cameras are built to capture footage in full color during the day and similarly during diminishing, low light or pitch darkness these devices are programmed to switch over to a night capture mode functionality that operates without any ambient light. The camera detects lowlight and switches to night capture and is able to capture footage even in pitch darkness. Monsoons in Goa are often fierce and weather takes an immediate toll on outdoor CCTV camera systems. In addition to the weather the hardware inside these devices also needs to be protected from dirt, temperature changes and also different climatic conditions. Thus external or outdoor cameras needs to be waterproof and cased in camera enclosures. These housings are available in multiple weatherproof ratings varying from zero to complete protection, protecting the hardware against dust, moisture and other weather intensities. IPxx is the rating visible on a camera that denotes its rating and tolerance to waterproofing. The first ‘x’ denotes that level of protection the camera is tolerant to against solid objects, the range being from 0-6 with 0 being no protection at all. The second ‘x’ denotes the level of protection against moisture which varies from 0-8 with 0 being no protection at all and 8 for complete submersion. Ensure that you are aware of the IP rating of the hardware you are installing especially if it camera that is to be placed outdoors. Modern security cameras are equipped with motion detection recording a feature that does not overburden storage of footage that would have been captured 24/7 drastically shortening the archive and space needed for storage on the hard drive of the DVR. Devices have the ability to be switched from ‘continuous’ to ‘motion activated’ recording in the device’s settings. This will not only help in maximizing storage space but will also help in capturing of actual events as they occur rather than hours upon hours of unwanted footage. There are limitations to motion detection capturing as it can be triggered by swaying trees, moving cars and even sharp shadows, however your system can be programmed to avoid capturing specific areas. H.264 is a one of the very latest video compression codec that drastically reduces the demands of your DVR’s storage and at the same time retaining the capture resolution of the device. In addition to this the H.264 compression also reduces the bandwidth required to transmit video footage into half maintaining the quality of the capture in the process. This is a feature that we strongly recommend having inbuilt into your DVR/NVR especially if you require remote viewing access frequently. Generally systems using this device are easy capable of storing a month’s worth of footage on a single hard drive. Apple was the pioneer in bringing about remote viewing access via smartphones and tablets making it possible to access video feeds from your security systems remotely without being physically present on-site to monitor footage. Using an internet connection and installing the relevant app on your smartphone or tablet you system is at your fingertips offering you compete mobility. The app would require you to sign-in with valid credentials and give you the capability to manage your security system from any location as long as you have an active internet connection. Earlier founded as Samsung Techwin, Samsung is a well established leader in electronics across the globe and in addition to surveillance systems the Korean based manufacturer is also widely known for products in aeronautics, optoelectronics and weapons technology. Based in South Korea, Samsung’s branch of CCTV manufacturing is known as Hanwha Techwin having a total employee strength of 4500 employees. The company is known to have begun operations in early 1977 with technical assistance cooperation from General Electric. In 2008 the company then ventured into European and North American markets for closed-circuit television/surveillance products that showcased numerous day/night cameras along with digital video recorders and further went to launch a series of digital IP-based cameras and network video recorders in 2009. Following a merger with it is sister concern Samsung Electronics in 2009 gave its line of products a major boost to its distribution channel capabilities. H-Focus is a UK based brand belonging to Hi Focus Electrovision UK Ltd which was established in 2003. The company has a large line of products that include the Quartz Series, Premium Series, Elite Series, Maestro Series, Rapid series and the Smart IP Camera Series. In addition to home security solutions the company also offers airport security solutions, shopping malls and public solutions, office security solutions , security solutions for banks and finance houses, solutions for populated area security solutions, city surveillance and mobile DVR solutions for transportation. Its line of products also include HD-AHD Technology Cameras, Biometric Systems, HD-CVI Technology Cameras, Samprt Ip Cameras, IP Technology (NVR) cameras, PoE Switches, XVR-Pentabrid Recorders and Video Door Phones. CP Plus was ranked among the top 3 security and surveillance brands by a survey conducted by HIS and is the youngest brand to be listed in the Top 7 Security Companies globally mainly attributed due to its strong RD and product capabilities. CP Plus is incorporated in Germany and has been in operation since 2007. CP Plus offers solutions to industries such as Banking with offering such as ATM Surveillance Solutions, Cash Van Surveillance, Branch Surveillance Solutions and Central Control Command. In the education industry CP Plus has comprehensive solutions for campus security, school bus surveillance, premiter surveillance etc. In addition to these industry verticals the company also provides solutions to industries such as hospitality, health care, police, real estate, retail and transport. Founded in 2001 by HIK Information Technology, Hikvision is a Chinese brand that has an employee strength of 18000 along with a team is 7181 engineers present in their R&D labs in 2015. The group witnessed rapid growth due to its successful line of products which saw the business being listed in the Shenzhen Stock Exchange in 2010. Hikvision today has its presence in over 155 countries and has over 2400 partners spread across these location. The company also has its corporate offices in 18 locations worldwide. Hikvision has a massive product line that includes network cameras, analog cameras, network video recorder, hybrid video recorder, video encoder and decoder cards, access control, traffic surveillance, network storage solutions, thermal cameras, PTZ devices, Digital video recorders, encoders, video intercoms, mobile solutions and transmission and display solutions. Of late the company has also ventured out to robotics and also has product offerings in area that include machine vision, mobile robot and unmanned aerial vehicles. This American multinational conglomerate business is one of the leading suppliers for corporations, governments and private consumers across the globe. The group classifies its business into four major categories; Aerospace, Home & Building, Safety & Productivity and Performance Materials and Technologies. Honeywell features among the Fortune 100 list of companies and was ranked 75th in the Fortune 500 list in 2016. The business has a total workforce of 130,000 employees of which 58000 are in the US alone. Bosh as a brand needs no introduction, the company ‘s innovation has led to the business filing over 5000 patents worldwide and has its presence in over 150 countries. The company is a German brand and is headquartered in Gerlingen founded by Robert Bosch in 1886. The company is has numerous solutions in a wide variety of areas such as for airports, banking, commercial, education, factories, hospitals, malls, natural parks, power plants, stadiums, theaters, transportation and more. Bosch’s product line includes video systems, intrusion alarm systems, access control systems, fire alarm systems, conference systems and cloud based services. Sony has strong offerings for the home security market and is one of the few companies that offer complete 4K solutions for video surveillance. Sony has been a market leader for a number of electronic goods and is has also made a significant strides in the area of home security hardware. Sony’s video security Camera Series is available in W-series, V-Series, E-Series, X-Series, C-Series and H-Series. In addition to this Sony also offers Minidome series that features fixed, pan-tilt and zoom capabilities. 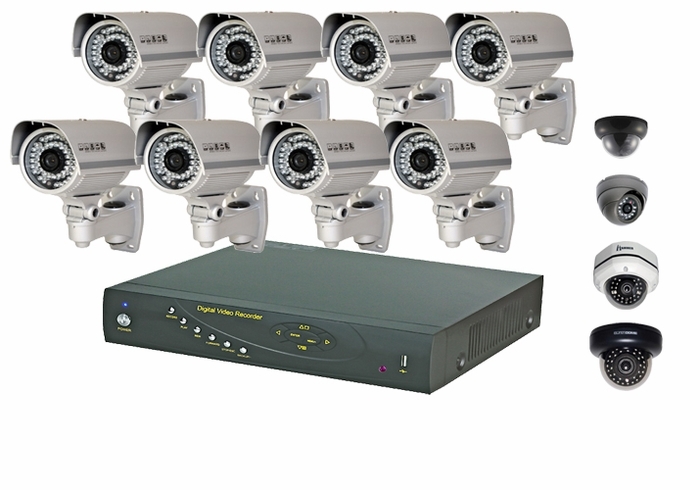 It’s entire range of offers in this segment includes IP security cameras, Analog security cameras, Network Video Recorders, Encoders and Network Video Management tools. The Indian based manufacturer has been steadily gathering a name for themselves for being a reliable and trustworthy brand that is made in the country. Zicom offers a variety of access control systems, cctv systems, fire alarm systems, intrusion detection systems and video door phone devices. The brand has competitively priced its products specifically for the Indian market and is known for its superior customer service. Being an Indian based business Zicom has its presence across all major cities in the country and in addition to hardware devices also offers services such as cctv monitoring services, fire alarm monitoring services, attendance monitor services, intruder alarm monitoring services, atm monitoring services, vehicle tracking and monitoring services and customer footfall counting services under their brand Zicom Care. LG entered the security business market in early 1999 introducing analog cameras and zoom modules and in 2004 ramped up its offering along with setting up an independent R&D lab and manufacturing unit for security devices. Between 2007-09 LG laid focus on software and its hardware offerings as it launched it Enterprise SI System Architecturing . In 2011-12 LG had expanded into a variety of products globally, although its security systems have not left much of a footprint in India, they do feel that India as a market for home security systems is on a growth trajectory and has immediate plans to expand its dealer base and support infrastructure.